I just love it when I stumble across a hidden gem. When I arrived at A’Dello Vineyard and Winery, owner/winemaker Dom Dellose was called back from his break. He proceeded to spend about 90 minutes showing me around and pouring some of his wine. I have to say that the wines are so good, that I can’t believe there is no buzz about this producer. Any lack of public awareness is likely due to the fact that A’Dello does not advertise. Since opening in 2009, the winery has relied on word of mouth and locally it seems to have worked. They have a loyal following and a stream of patrons passed through the tasting room while I was there. According to Dellose, his basic production philosophy is to make good wine and this equates to wines he wants to drink. Toward this end, I was quite impressed with all of the offerings, but red wine is the A’Dello superpower. The red wines all see about 24 months in oak and there is no compromise on that basic principal. The result is reds that are both big and complex. It’s hard to find fault with that. Another thing that I can say about Dellose is he is extremely passionate about his craft. After he introduced himself, he poured me a glass of Cabernet Franc and led me back into the winery. My tasting did not follow a typical flow. Instead, we began with a few barrel samples. The we went back to the tasting bar, where Dellose began pouring wine. After every tasting pour, he would say “I’ve got one more I want you to try.” This went on for a while, but it gave me a great sense of what is happening at A’Dello. I tasted some very nice white wines. The Riesling and Sauvignon Blanc are both worthy of note. Even the peach wine, which was done in a very dry style, was extraordinary… but like I mentioned earlier, the reds are the main event. Real standouts included the Cab Franc, which was big, complex and jammy. There is a place for this style of Cab Franc and I am a fan. I really like the Chambourcin as well, but the Cabernet Sauvignon was off the charts. It was rich and textured, with structured tannins in a very long finish. This is obviously A’Dello’s signature red. One bit of bad new is the spotted lanternfly infestation that has taken hold in Southeast Pennsylvania. A’Dello Vineyard and Winery lost their entire vineyard. 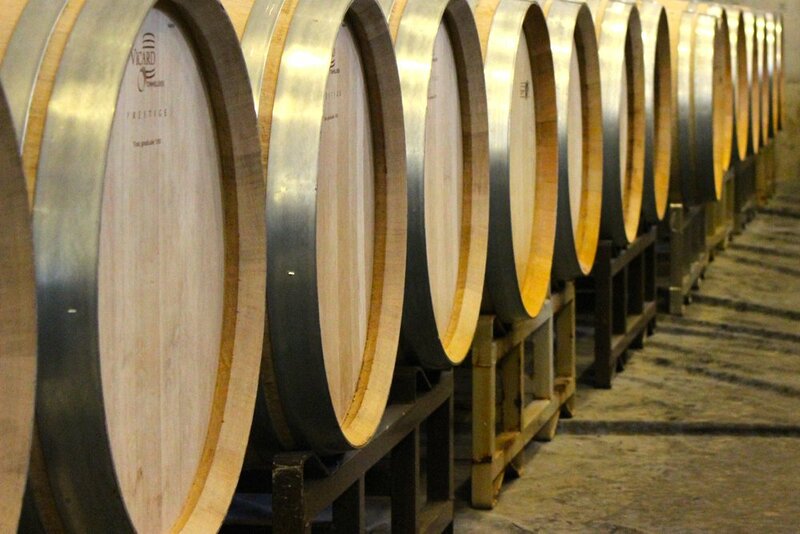 In the nearterm, there are two years of red wine in barrels. Dellose is making every effort to source fruit locally and appears confident that he can keep making wine. In the meantime, let’s make an effort to support this winery. After you stop in, please let me know what you think. When we arrived, Borderland was closed. So definitely follow my advice above and check the website for hours. Despite that minor setback, we were able to wonder about the grounds and take a few photographs. Although located only 30 minutes from Philadelphia's suburbs, Borderland occupies an idillic rural setting that was once a working farm dedicated to sheep and a few other assorted animals. Today, a small flock of sheep still grazes in a pasture below the old farmhouse, but vines are the primary agricultural activity. I have heard rumors that the Borderland wines are well crafted. That bit of intelligence along with the beauty of the venue may inspire me to stop in again at a later date. In the mean time, if you happen to stop in, please share your observations. Since opening for business in 1982, Chaddsford Winery has been lauded as a pioneer in the Pennsylvania wine industry. Today, the winery sources most of its fruit from around PA in order to make 30,000 cases annually. This makes them the largest producer in the state. In recent years, Chaddsford has gained a reputation for producing of sweet wines and as a venue designed to attract large weekend crowds. I can say, based on my recent visit, the winery is turning out some well-crafted, dry-style wines. There are indeed a number of crowd-pleasing sweet wines, but let’s not throw out the baby with the bathwater. There are some serious wines in the lineup and, while it is fair to say Chaddsford is trying to please a range of palates, there seems to be a trend toward quality. It is reasonable to expect that other nearby wineries of note will force Chaddsford to up its game. This winery is an important local player and I recommend stopping in. After you do, please let me know what you think. You might be surprised to learn that there are a couple hundred wineries in Pennsylvania. The overall reputation for quality is somewhat spotty, but the southeastern corner of the state near Philadelphia is one the bright spots. Located about 30 miles west of the city, Galer Estate Vineyard & Winery is one of that region’s premier producers. I recently stopped by the tasting room on a particularly grim winter morning. I sat down with owner Brad Galer and winemaker Virginia Mitchell to talk about the winery and taste a few of their offerings. The Galer Estate project began back in 2005 when Brad’s wife Lele told him to “find a hobby.” As often happens, that pastime grew in scope to take on a life of its own and is now a full-fledged boutique winery business. Lucy Morton was brought in as a vineyard consultant. The result was seven acres of high-density vines planted over 3 years at Galer’s Home Vineyard. In 2008 the Galer’s purchased an existing winery, which included four additional acres under vine. Today, by supplementing the seven acres of estate fruit with a small additional of locally sourced grapes, Galer Estate produces between 2500 and 3000 case of wine annually. Current production levels are unlikely to increase, but the goal is to continue improving quality and to eventually use 100% estate fruit. The tasting room and winery were a separate challenge. The space required major renovation. The Galer’s consulted with John Levenburg and upgraded the winery equipment. Lele remodeled the tasting room to create a comfortable space for visitors. It all came together and opened to the public in 2011. Winemaker Virginia Mitchell received formal enology training from Penn State and gained practical experience in northeastern Pennsylvania and Australia before landing at Galer Estate. In my estimation, she is a rising star in the industry. There is nothing pedestrian about her wine. She is currently bottling wines that I will categorize as great and a couple flirt with world-class status. We tasted through five of the Galer Estate offerings. The whites included a Vidal Blanc done in a vino verde style, a Grüner Veltliner and reserve Chardonnay. All were well crafted and perfectly balanced. The Vidal and Grüner, in particular, were just over the top. The bright acidity and tropical notes of the Vidal stood out and made it one of the best examples of that varietal that I have ever tasted. We also sampled a pair of reds. The Bordeaux-style blend was solid, but Mitchell nailed the single varietal Cabernet Franc. It had hints of tobacco on the nose, red fruit mid palate and a long finish. It is easy to understand how it won double gold in San Francisco. The wine is enough reason to visit, but the area offers more than just Galer Estate. Other nearby wineries of note include Penns Woods, Va La and Stargazers. Longwood Gardens is right next-door and the lovely little town of Kennet Square offers a variety of dining options. So there are plenty of excuses to explore the area. At the end of the day, this is one winery that should not be missed. You cannot pretend to know anything about Pennsylvania wine until you have visited Galer Estate Vineyard and Winery. After you stop in, please let me know what you think.